Have you been to a toddler’s birthday party recently? Have you been there to watch the birthday boy or girl open the presents? (Ok…let’s face it….often it’s the parents opening the presents…but I digress…) If so…You have probably seen them. The bright, talking, light up, toys that move and sing. “Activity tables” and “books” and pull toys…even stacking toys, rattles, teethers, and balls….all that are hard, plastic, and make noise. Yes, even the teethers are “educational.” Aren’t teethers supposed to like, sooth the gums? And the balls…they cant just sell a red, rubber ball that bounces. No, the ball must “teach” letters and numbers by making noise. (**Ok, ok…so maybe they don’t get that crazy….yet). Nothing could have prepared me for the influx of “educational toys” we would receive at my own children’s birthday parties. Everything needed batteries. Everything made noise. Even the awesome Little People Farm and the Little People Pirate Ship had buttons! There is one specific toy that my daughter got for her first birthday (ok, a couple actually) that made me really step back and think about what “toys” are for. One was this Monkey Ride on toy thing…that made annoying noise and sang…and there was something about rowing the arms and catching bananas? See I can’t even remember the point of it because there was no point to it! My daughter tried a couple times but it made no sense to her either…it quickly got donated. I noticed that pretty much all the toys by a certain manufacturer that claimed all their toys were “learning” toys and “educational” were also the ugliest, brightest, loudest, and hardest. And quite frankly, they taught my one year old absolutely nothing. Except that if she pushed that button the toy produced noise. 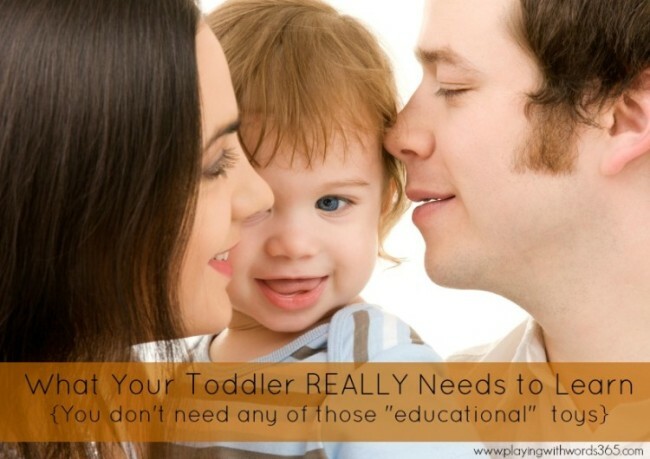 I started thinking….what does my toddler really need to learn right now anyway? And how would she learn anything from toys that just lit up and sang? A toddler does not need to know numbers, letters, or shapes. A toddler doesn’t need toys that light up and make noise. Some simple, non-noise-making toys (most or all of which you can get at second hand stores…for some suggestions check out my post on toys HERE) and/or simple and free household items like cardboard boxes of different sizes; plastic cups, bowls, and spoons, old gift bags with handles (my kids LOVE putting random things in these! ), baskets, paper, crayons, paints (you can make paints too! ), etc. Notice none of the above require batteries. Toddlers require love, kisses, and attention. Not batteries. So…next time you are in the toy department, skip over that aisle (you know the one I’m talking about…) and pick up some finger paints and a sand bucket instead. Or maybe some bubbles and a… gasp… plain rubber ball! As for some of those toys that seem pretty cool but yet still make noise (Like the Little People Farm ?) Do what I do, and take out the batteries. Thank you, thank you, thank you! Bells and whistles be gone! I agree with you that toddlers need only objects to manipulate, things to crawl over and to and paper to scribble on. Getting back to the basics just may bring back creativity! Thanks for putting it out there. I hope your readers listen to your great advice! Great article! The cardboard box has always been a favorite around my house. At one point I decided to give my kids a present of a few boxes rather than buy toys that they would neglect while building castles out of the boxes that the toys came in. Other favorite toys have been sticks, rocks, and the absolute best… MUD! Mud can be a prehistoric site for dinosaurs, a building material for castles and little tunnels, the main ingredient for mud pies, and best of all, it’s messy! Even better… mud/dirt is GREAT for developing immune systems. Yay! I’ve been feeling this way for years, and now I have an article by a professional to back me up 🙂 I’m not a speech pathologist OR a parent (first baby due in April), but I firmly believe that so-called “educational” toys do little or nothing to develop imagination, among other things. I sometimes wonder if they contribute to short attention span and the instant gratification issues as well. Totally agree! This is a great post for anyone interested in toys shopping. We love battery free toys and how they can stimulate speech and language particularly in babies and toddlers. ha! Totally agree with you on the Little People toys. (And pretty much everything else in this post!) A family member bought our daughter a Little People Halloween set for her birthday/Halloween. (Her birthday is at the beginning of October.) I was surprised and kind of appalled when I saw that it took batteries. Hubby and I both agreed that we weren’t going to waste batteries on the darn thing. She could care less about it when she first got it. She is 16 months now and has recently started LOVING playing with this…sans batteries and all. 🙂 She loves making the Little People “walk around”, bounces them on her legs, and puts them in and out of her Halloween set. Hooray for imagination, right?! YES! Exactly! Hurray for imagination! Ban battery powered toys for tots!! I was appalled to see my 1 year old granddaughter race wild-eyed from one lighted noisy toy to another. As a mother and (former) speech therapist, I was looking forward to reading stories and having tea parties with her. This is not to be. At 5 she still can’t form a sentence or pay attention to anything except TV and mobile phone apps. I have no doubt that early sensory overload contributed to her autistic symptoms. Thank you for writing this post. I wrote a similar one on my blog (though with more vitriol, I must admit. I couldn’t contain my anger). It saddens me that companies after the almighty dollar are using the emotional blackmail of “education” to market and sell crappy plastic noisy toys. It’s a BALL, why does it need to light up and sing? I feel that when dollhouses and barns talk, the kids don’t have to supply their own voices, and imagination and pretend play suffer. Toy companies are taking all the imagination out of playing with these new and ‘improved ‘ toys. That may be why classic toys are always such a blessing to find at garage sales! So the toys that make noise and say things and play music drive me crazy. I’d rather not have them because of the sheer element of distraction and noise. However, I think one of the reasons there is a big push towards these educational toys so early is because of pressure on the parents to help their kids succeed in school early. It seems that standards in schools for kids are getting higher, which may be a good thing. But it does seem that children have got to have shapes, colors, etc. down before they go into preschool. I’m not positive on that, but that seems to be the reason parents are so intent on teaching their children shapes and such. What are your thoughts on this? In those kinds of circumstances, could these educational toys be more justified? This is the first time I have happened upon your blog, so I’m unaware of your thoughts on the matter. This is so helpful! My toddler has many vtech noisy type toys and they are no help.. He is behind in his speech development and I will definitely switch his toys out with the toys you suggested. Thank you for your post! I agree whole heartedly with your take on educational toys. Toddlers need to interact with their world and learn cause and effect not just from pushing a button and seeing a light or hearing a noise. Your information you have given is very helpful, which we do a lot of what you suggested. But yes of course we do get some of the lights and sound toys, I will start limiting or yes take out the batteries. My grandson’s Dr wanted us to get him Audiology testing done for speech delay. My grandson’s speech is getting better little by little each day, Some of his pronouncing sounds come in clear, some don’t, he jabbers from time to time then says a couple words at the end of his sentence, so I know what he is saying. What do you think we can do more to help him?